I have finally managed to get a little sample of llama fiber from Charlie. I say "finally managed," because I learned very quickly that llamas don't particularly like to be caught and handled. Since I wrote an update about Charlie on my homestead blog, I also wanted to show you his fleece. I figured my sadly neglected fiber blog would be the best place to do that. I managed to get a couple of staples from his shoulder. While they measures three to six inches in length, this isn't an accurate assessment of a full year's growth. He's only seven months old, and has had one shearing, albeit a poodle type blanket cut. Nor did I cut this close to the skin, but left enough on him so he wouldn't look like he had a patch of missing wool. Because Charlie's so young, his fleece is wonderfully soft. He was sold to me as a "woolly" llama, and I have since learned that there are several types of llamas, based on their wool. Tapada llamas are the woolly llamas. 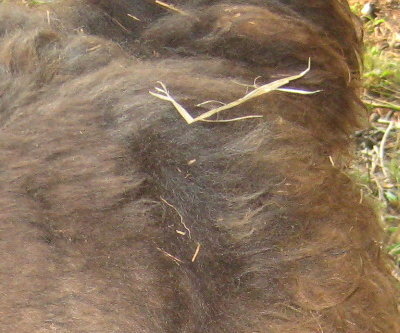 Their fleece in medium to long, dense, and can be silky, crimpy, and wavy. 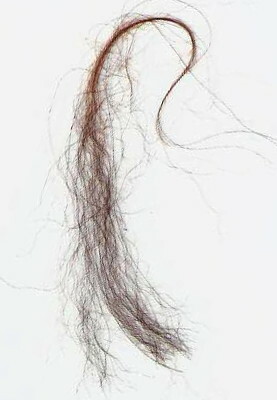 They are considered single coated and should have less than 1% guard hair. They need shearing once a year. Lanuda llamas, are another woolly type, but these grow wool all the way down their legs. I didn't know enough to ask the breeder about the wool types, but based on how his fleece is growing out, I'm guessing Charlie is one of these. He had his first shearing before I bought him, so I don't' know what he'll look like with his fleece completely grown out. 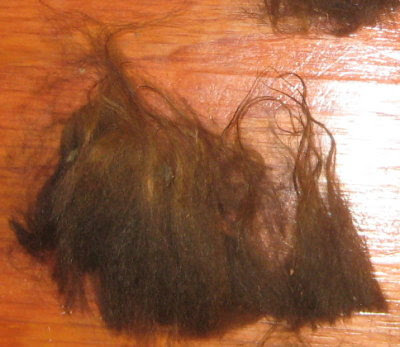 Llamas are shorn once a year, and that will be a job for next spring. 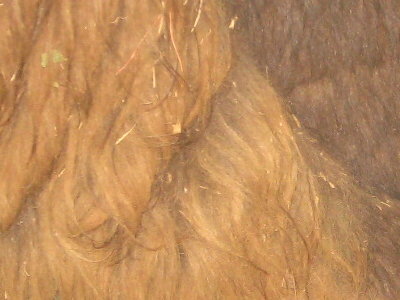 Curaca are medium wooled llamas, with guard hair content averaging 3 to 15%. 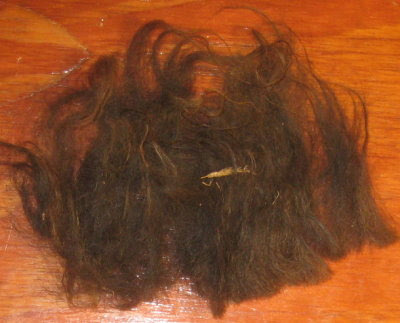 Unlike tapadas and lanudas, which must be shorn, cucacas shed somewhat. Because of that they are often shorn every two to three years. Their wool grows below their knees like lanadas. Ccara llamas are the classics. 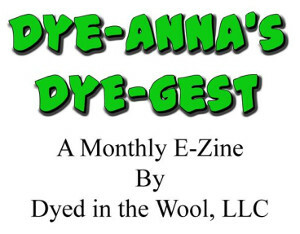 They have fairly short, double coats, the guards accounting for at least 15% of the fleece. Because of the guard hairs, they don't pick up a lot of debris (which Charlie is always full of). Of course the downy undercoat is what a spinner wants. A ccara's is semi-crimpy and evidently fairly easy to harvest, as only the inner coat sheds. Removing it is a matter of grooming it out. No shearing or clipping required. Before I got Charlie and began researching this, I didn't have a clue. I had never spun llama before, but now I understand why spinners have such different experiences with it. Here's a scan on the left. I don't know how well you can tell, but I'm assuming that the straight fibers are guards. The rest of it has an undefined crimp of about 10 or 11 per inch. His wool will get coarser as he gets older, but how much remains to be seen. It contains no grease, but is dusty and loaded with VM. This is because llamas like to roll in the dirt, in the grass, in the weeds, in the brambles, whatever. It kills me to see Charlie loaded with VM and at first, I wanted to comb him out every day. Llamas however, don't like being petted or brushed and combed. I quickly figured out that if I messed with his fleece every time I caught him, he would soon be very difficult to catch. So we've been working on trust, and that means respecting his "no touch" rule. I should mention that this rule appears to apply to humans only. It's okay if a chicken perches on him, of if a goats plops down right beside him. It's just not okay for a human to touch him. I haven't had a chance to spin it yet, but when I do, I plan to card it and spin woolen. I'm sure though, that I'll do a lot of experimenting with it. I'm very curious as to how the yarn will turn out. Hopefully I'll have a chance to do that soon. To see photos of Charlie and read what I'm learning about llamas, visit my homestead blog, here. A Little Sample Of Llama © September 2010 by Leigh at Leigh's Fiber Journal. Looks like your gonna have a lot of fun once Charlie gets sheared next year. The fleece looks really soft even in pictures. The easiest way to clean a llama before shearing is with a blower. They have to get used to it, but since they don't have grease in their fleeces, the stuff all blows out (or mostly). Some actually get to where they enjoy it. I'm glad you are refraining from brushing him every day - it's a sure way to end up with no spinnable fiber when he's shorn. I once judged a "fiber on the hoof" class at a local llama show in Reno. One of the women had a beautiful llama, much like Charlie in color and wool type - however, he had been over groomed, and there was no down fiber left. She came to ask my why she didn't place, and I told her! He looked great for the show, but as far as spinnable fiber, there wasn't any! Bettina, I'm figuring it just comes with the territory. We'll see what happens when he does finally get sheared. I agree that the dust isn't so bad though. At least I haven't thought so in the alpaca I've worked with. Laura, I will have to try the blower. Or rather, I'll have to try getting him used to the blower! Interesting about the groomed out fleece. It's good you gave her that feedback too. I'm sure it was helpful in the long run. Looks like beautiful fiber to me! Great info on the different types of llamas and how that affects their fiber! In Yellowstone, we saw bison rolling and even just scratching the heavily fleeced parts of their bodies (heads and shoulders mostly) against the ground or against trees. I wonder if that serves a similar purpose for them....we couldn't decide....but it's interesting that llamas like to roll too!